If you haven’t had the chance to try CI Knock–Offs just yet, then I’ll give you a minute to brush off the dirt and debris from that rock you’ve been living under. All good? Ok, let’s continue. The blends in our Knock–Offsline are easily among the ten best-selling brands of all time, and deals on these beauties are all but non-existent. I just checked, and it looks like we’ve only done one measly deal in the past decade. So listen up, because I’m only going to say this once: this deal is out. of. control. 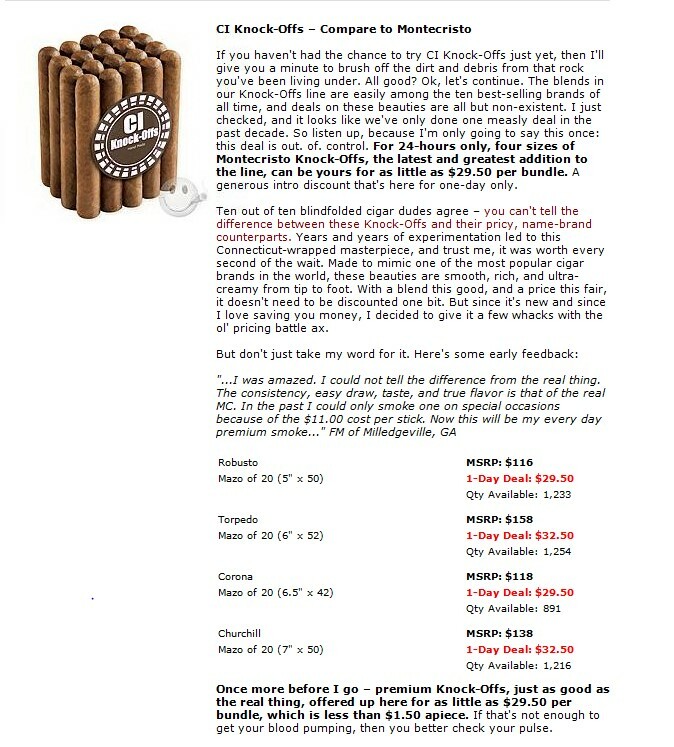 For 24-hours only, four sizes of Montecristo Knock–Offs, the latest and greatest addition to the line, can be yours for as little as $29.50 per bundle. A generous intro discount that’s here for one-day only. Ten out of ten blindfolded cigar dudes agree – you can’t tell the difference between these Knock–Offs and their pricy, name-brand counterparts. Years and years of experimentation led to this Connecticut-wrapped masterpiece, and trust me, it was worth every second of the wait. Made to mimic one of the most popular cigar brands in the world, these beauties are smooth, rich, and ultra-creamy from tip to foot. With a blend this good, and a price this fair, it doesn’t need to be discounted one bit. But since it’s new and since I love saving you money, I decided to give it a few whacks with the ol’ pricing battle ax.